Today we remember an artist that through culture and music influenced an entire nation and beyond. Pete Seeger, a symbol of protest music, supporter of environmental causes, civil rights and international disarmament died this week. His career spans a huge range, from 1954, with Pete Seeger Sampler and How to Play a 5-String Banjo till 2013 with The Storm King – Stories, Narratives, Poems. In the late 1950s, his anti-war songs became very famous. Below you can hear his famous tune “Where have all the flowers gone?” (which was co written with Joe Hickerson). How much impact can a 5 string Banjo have? For many Pete Seeger was the conscience of America and american music, a demonstration of the power of culture to influence history and to move it, and to push it and to encourage it to become more human, closer to the people, the real humans, men, women and children that are the faces of life. 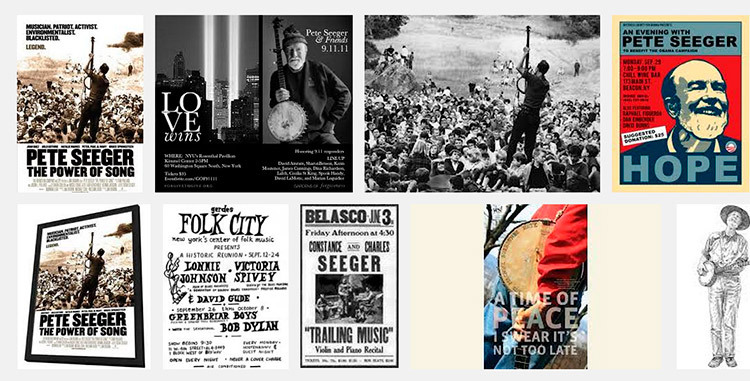 Have you ever seen any poster of Pete Seeger? In the picture above we see some of the posters associated with his career. Posters became a key part of Pete’s influence, combining typography, design and photography to spread his message about peace, love and union. Each Peter Seeger poster reminds us that his words, his lyrics, his message, his music was visual and real in the hearts and lives of those that listened to them. The union of typography and visuals becomes a metaphor of the union between the message of the artist and his influence on the live real world and planet.